WEEKLY CHAT/FILM VIEWING: We begin our Charlie Chan Film Tour for 2016 with Behind That Curtain. E.L. Park appears briefly as Charlie Chan and we are treated to an "talkie" appearance by Boris Karloff. Please join us as we discuss this film LIVE, watching it together via personal video! 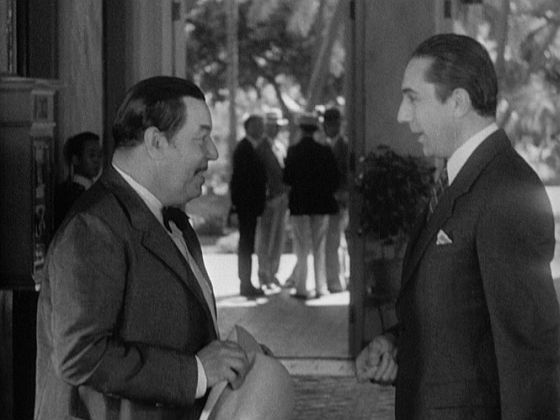 WEEKLY CHAT/FILM VIEWING: Eran Trece, the Spanish language version of the "lost" Charlie Chan Carries On, starring Manuel Arbo as Charlie Chan. Please join us as we discuss this film LIVE, watching it together via personal video! Keye Luke, who portrayed Charlie Chan's number one son, Lee, in twelve Chan films and one Mr. Moto movie, dies in Whittier, California of a stroke on this day in 1991. WEEKLY CHAT/FILM VIEWING: The Black Camel starring Warner Oland in the oldest existing picture from the Charlie Chan film series proper. Please join us as we discuss this film LIVE, watching it together via personal video! J. Carrol Naish, who would play Charlie Chan in The New Adventures of Charlie Chan television series (1957-58), is born in New York, New York, on this day in 1896. He also played Gangor the snake charmer in the Charlie Chan film Charlie Chan at the Circus (1935). WEEKLY CHAT/FILM VIEWING: We celebrate the birthday of J. Carrol Naish who portrayed Charlie Chan in the TV crime Drama, The New Adventures of Charlie Chan, as we view and discuss two episodes: The Secret of the Sea and The Lost Face, sharing these adventures LIVE, watching them together via personal video! J. Carrol Naish, who portrayed Charlie Chan in The New Adventures of Charlie Chan television series, dies in La Jolla, California, on this day in 1973. Kamiyama Sojin, who would portray Charlie Chan in The Chinese Parrot (1927), is born in Sendai, Japan, on this day in 1884.